I couldn't be more excited for today as it is one of my favorite days in our little neighborhood. The Beacon Hill Holiday Stroll is an evening of Christmas festivities including victorian carolers, the lighting of the towns tree, carriage rides with clydesdales down Charles Street and of course the excitement of Santa's arrival to pass out treats to all the kiddos. If you are in the Boston area, it's a super fun evening with or without having kids. I feel especially lucky this year that my folks will be in town visiting and my sweet hubs rearranged his work schedule to join in the fun. Since my mom has never been to my apartment I thought I would put together a festive cocktail and buy a little pre-made snack for enjoying before we head down to soak up the holiday spirit! 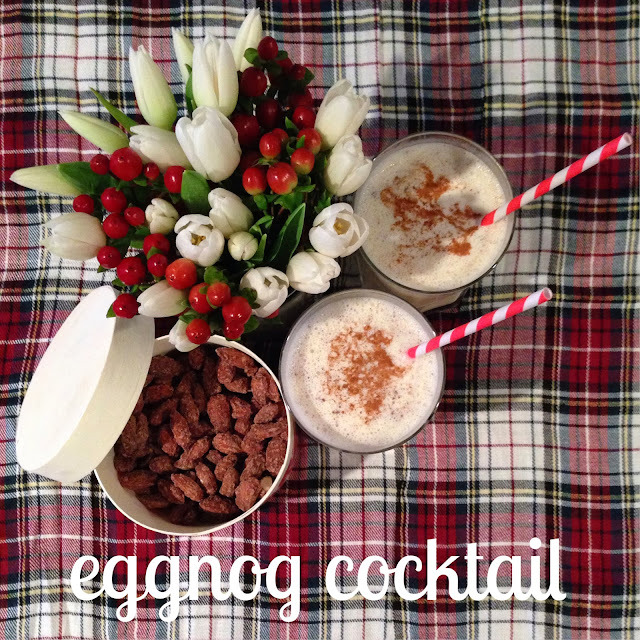 Garnish with a sprinkle of cinnamon & enjoy!